Joint pain can happen to anyone, at any stage of life. However, it's particularly prominent during times of hormonal imbalance, such as menopause. Fortunately, there are things that you can do to relieve joint pain. One way is taking herbal supplements. 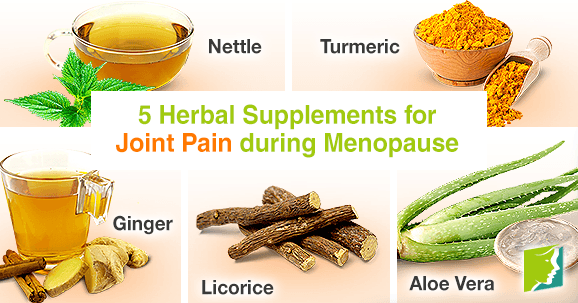 Continue reading to learn the best five herbal supplements you can take for joint pain during menopause. The nutrients in nettle make it one of the best supplements for joint pain. Nettle is rich in vitamins A, B, C, and D. It's also a good source of iron, magnesium, and calcium. Combined, these nutrients give nettle anti-inflammatory properties which can relieve joint pain. Drinking nettle tea is one of the best ways to reap the benefits of this herb. Turmeric contains curcumin and curcuminoid, making it a natural and effective pain reliever. These two chemicals work to decrease inflammation and ease joint pain. Turmeric can be consumed in food, taken in supplement form, or applied topically as a poultice - in some regions, turmeric based ointments are available as well. The anti-inflammatory properties of ginger stem from the same compounds that produce it's strong flavor. You can consume it as a supplement, grate it into meals or brew it into a heart-warming herbal tea. Licorice decreases free radicals at the site of inflammation, which relieves joint pain. One of the licorice's components, glycyrrhizin, is responsible for relieving inflammation. Use licorice as a herbal tea or as a supplement. However, avoid it if you suffer from high blood pressure or low potassium levels. Aloe vera is well known for its soothing powers. However, people who are looking to consume aloe vera (for example, in aloe vera drinks) instead of applying it topically should consult a doctor first, as it can have some side effects such as decreasing blood sugar levels. Joint pain can have a serious impact upon your life. However, it is not necessary to simply suffer from it. There are ways you can ease joint pain, and one of these ways is by taking herbal supplements. By learning about which herbal supplements can help relieve pain you can make the first steps towards curing joint pain. What Causes Joint Pain during Menopause? Joint pain tends to affect the body with age, and it can be frustrating to deal with, especially if it happens along with menopause symptoms. Joint pain and fatigue can plague women as they age and can signify an underlying medical condition that should be addressed. A poorly fitted bra can cause back and joint pain. Help your back by making sure your bra is giving you the right fit and support.